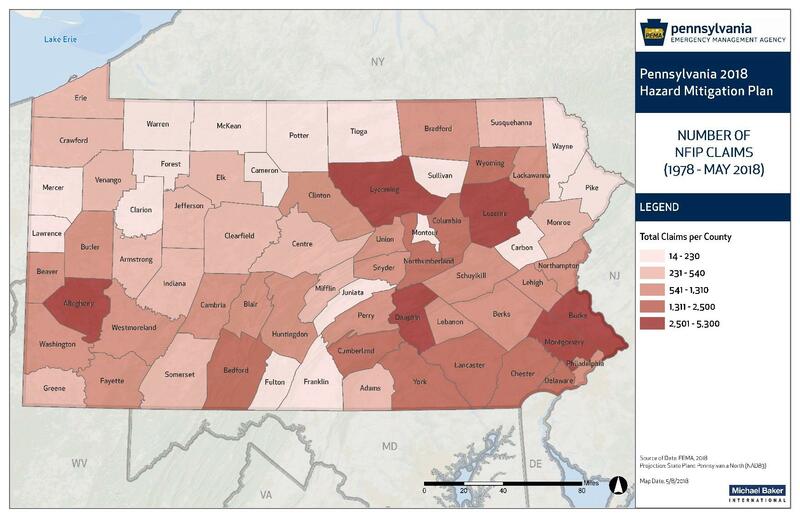 Flooding is the temporary condition of partial or complete inundation on normally dry land and it is the most frequent and costly of all hazards in Pennsylvania. Flooding events are generally the result of excessive precipitation. General flooding is typically experienced when precipitation occurs over a given river basin for an extended period of time. Flash flooding is usually a result of heavy localized precipitation falling in a short time period over a given location, often along mountain streams and in urban areas where much of the ground is covered by impervious surfaces. The severity of a flood event is dependent upon a combination of stream and river basin topography and physiography, hydrology, precipitation and weather patterns, present soil moisture conditions, the degree of vegetative clearing as well as the presence of impervious surfaces in and around flood-prone areas (NOAA, 2009). Winter flooding can include ice jams which occur when warm temperatures and heavy rain cause snow to melt rapidly. Snow melt combined with heavy rains can cause frozen rivers to swell, which breaks the ice layer on top of a river. The ice layer often breaks into large chunks, which float downstream, piling up in narrow passages and near other obstructions such as bridges and dams. All forms of flooding can damage infrastructure (USACE, 2007). Pennsylvania has a long and continuous history of floods. 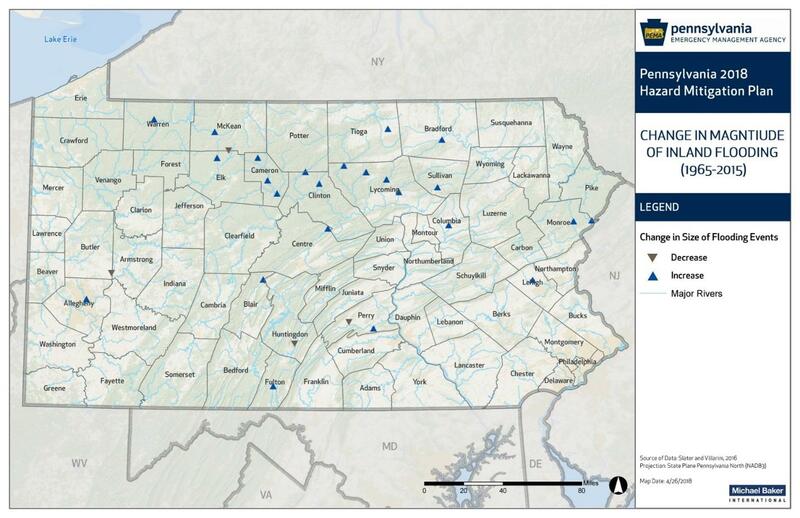 A significant number of the Presidential Disaster and Emergency Declarations in Pennsylvania have been in response to hazard events related to flooding. 24 counties have had an average of one flood event per year. With a warming climate the trend of increased frequency and magnitude of heavy precipitation events is highly likely to continue. There are also mostly increasing trends in maximum streamflow in the Northeast consistent with the increase in observed extreme precipitation (Wehner et al. 2017) which increases the risk of flooding. Pennsylvania Flood History, 1950 to 2017 (NCEI, 2018). Rate of Precipitation Change from 1901-2016 for Pennsylvania (NOAA, 2016).